Andy Leimontas lives in Buenos Aires, Argentina, with her husband and three children. Since 2001 she has been working as an English teacher for young learners. Funny and surprising stories are the only thing that her classroom cannot be short of. A restless imagination and children everywhere are the perfect brew for story-telling. 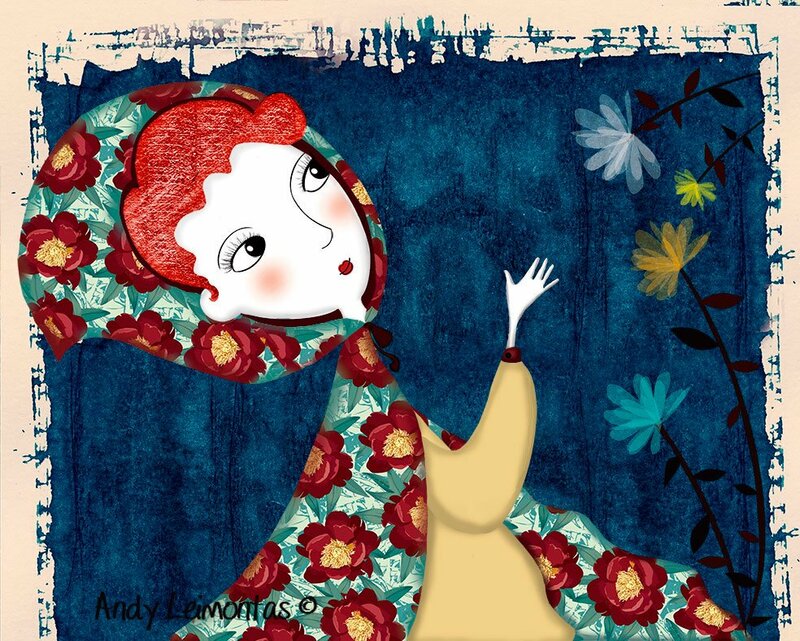 Andy has been telling her own stories at home and school for many years, and it was time to bring them all to life. She has taken art lessons with respected artists and illustrators such as Darío Aguilar, Mónica Weiss, Natalí Sejuro, Leicia Gotlibowski, and Carlos Higuera. One of her pieces was selected for the “Feria Internacional del Libro de Guayaquil” in Ecuador, and some of her illustrations were exhibited in Sudestada 937 Gallery in Tigre, Buenos Aires. Once I have an idea in mind, I start sketching on my notebook. I focus on the scene composition, the characters’ poses and the background. The color comes later. I like an illustration that tells a story. After the final idea is more or less defined on paper, I use my scanner to digitalize it. My sketches tend to be very rough, but it’s all I need; with the scanned image on the screen I begin working on the color palette and making any necessary adjustment to the illustration. I love to use limited colors palettes. 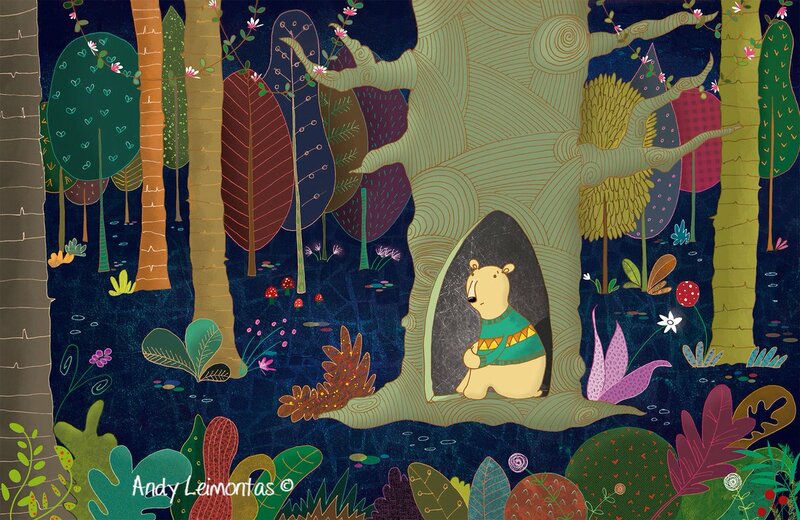 I use Photoshop to color my illustrations and create textures with different materials I find at home. Photoshop allows me to create brushes to get specific effects or patterns. I am always looking for textures that look interesting and that I can snap a photo of and digitalize. Finally, I work on details, adding contrast in some areas or modifying some shapes to get a better final work. I’ve been illustrating for 4 years now. Have you always lived in Argentina? Yes, I was born and raised in Buenos Aires. Does Buenos Aires have a vibrant artist community? Yes! Buenos Aires is known for its multi-cultural scene and an amazing artist community really aware of the demands of this modern and lively city. From its architecture to its theatres, museums and art galleries, Buenos Aires radiates art and culture. What and when was the first painting or illustration that you did where someone paid you for your artwork? I recently started to create illustrations and write stories for children with the idea of, someday, to become a professional artist/writer. You could say I am new to this amazing world! I got to sell an illustration in a small exhibit 2 years ago. That was my first sale. Did you study art in college? If so, what school? Your website says you are taking art lessons with well-known artists and illustrators. Could you tell us more about this? I’ve always loved to draw. Growing up, I would spend hours drawing and crafting art projects; it’s been always a hobby of mine. When I finally decided to become a professional illustrator, I knew I had to learn more about the formal process, so taking art classes was the next logical step. I started taking classes with the great professor Darío Aguilar, who introduced me to this business, and showed me the tools of the craft. By taking classes and experimenting on my own, I was able to develop my technique and find my own style. I also took classes with Mónica Weiss, Leicia Gotlibowski and Carlos Higuera. What do you think influenced your style? I think that wanting to try every new thing I learnt combined with a lot of testing forged the road to where I am now. What type of job did you do right after you graduated? I have a degree in hotel management, but my first job was as an administrative assistant. Then I got married, and while raising my children, I decided to go back to school to become an English teacher and I’ve been teaching ever since. How did “The Catch of the Day”, happen to get selected for the Feria Internacional del Libro de Guayaquil, Ecuador? Can you tell us a little bit about this award? As a beginner illustrator, one of the best things you can do is try to send your artwork to as many contests as you possibly can. So I sent this piece to be included in the Roald Dahl’s commemorative display at the Feria del Libro, and to my surprise and delight it was selected! When did you decide you wanted to illustrate for children? I’ve been teaching and working with kids for a long time. I love to tell stories and build these big displays and posters that we hang in the classroom’s walls, just for fun and to make the stories more interesting. I am very creative and kids are very visual, so it was the perfect match; I knew I had to take advantage of this. First, I was more interested in writing children’s stories, but then I thought… why not? Drawing comes so naturally to me… I could illustrate my own stories. It was like a door had just opened in front of me and I had this huge, amazing playground to set my ideas free. Have you had an opportunity to illustrate a picture book, yet? If so, what was the title? No! I´d love to! It’s a hard business because there are thousands of excellent illustrators. I haven´t had the chance yet. Have you ever gotten an illustration job with a US publisher? I would love to! I’m just starting to promote my work. Do you have an artist rep. If so, who and how long have you been with them? I am in the search of an agent. I know it can be a long process, but I am confident that I will find one soon. I see that you are an English teacher. How did that come about? How old are the children you teach? When I was a little girl I took private English classes, and once I had my first child I realized that it was funny and challenging to teach English to young learners. I attended college to become an English teacher and, at the present, I am in charge of 2nd grade students. Do you ever try to fit in creative writing with your students? All the time! Kids are very open to new things; they really enjoy experimenting with their own creativity. They are a fantastic source of inspiration as well! Are you able to incorporate your artistic skills into your lessons with your students? Of course! They know I love to illustrate so Art is always part of my lessons. Do you participate in art exhibits to market yourself? Not much. I have started to promote my work just recently. Do you have any desire to write and illustrate your own children’s book? Yes! That is my dream and I’m working hard to make it happen. Would you illustrate a book for an author who wants to self-publish? Even though I would be more interested in a traditional publishing project, I don’t see why not. The market is much more inclusive and competitive nowadays, so you have to be open to new trends. Have you tried to illustrate a wordless picture book? No, but that would be fun! What do you think is your biggest success? After investing so much time on developing a technique, experimenting with different media, and basically trying to find a style I am comfortable working with, and gives life to my stories, I finally feel I am ready to take my dream to the next level. That is my biggest success so far. Be ready for the big challenge ahead. Have you done any book covers? No, but that’s something I would enjoy doing. What type of things do you do to find illustration work? As I’m trying to promote my work, social media is very important to get the word out. I’m pretty active in Twitter, buy also have a website. And, of course, I participate in contests and send my portfolio to agencies. 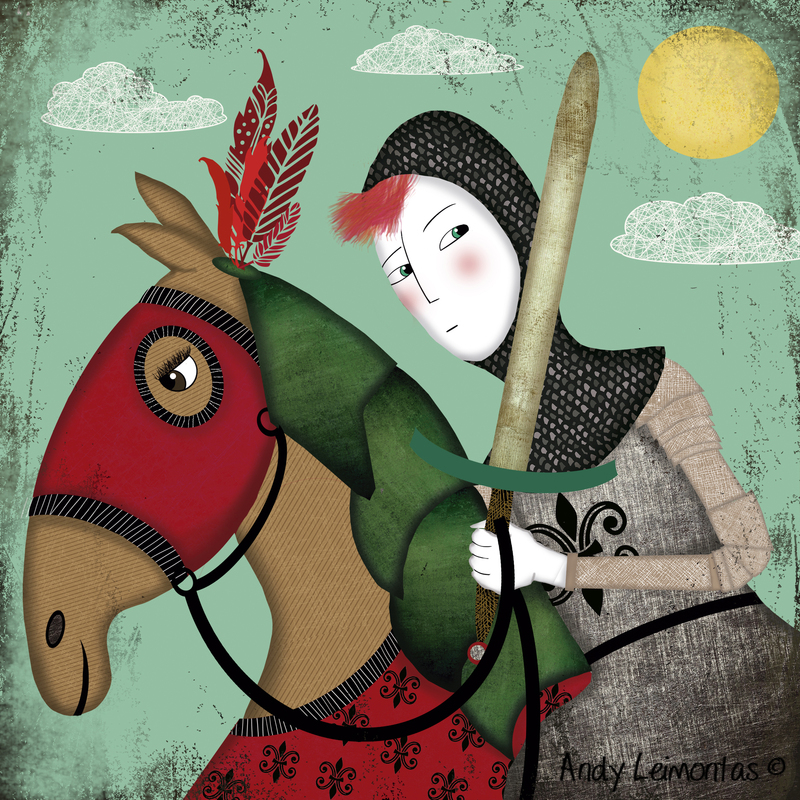 I love to illustrate with mixed media, a combination of manual and digital work. Has that changed over time? Yes. In the past I used to work with pastel chalks, one of my favorite mediums. Do you have a studio set up in your home? Yes, a small corner in my attic that I am remodeling these days. I try to work at least a couple of hours a day. Do you take pictures or do any types of research before you start a project? I use a lot of pictures as reference. Sometimes I need to imagine a specific body posture or scene so I ask any volunteer at home to pose for me and then I use those photos as a guide. Online research and books are great sources of information too. Definitely! It has simplified things and opened doors on a global scale. Do you use Photoshop or Painter with your illustrations? I use Photoshop all the time. I´d like to. I have one but I need to find the moment to try it. Aside from working at school and at home (I’m a mother of three!) 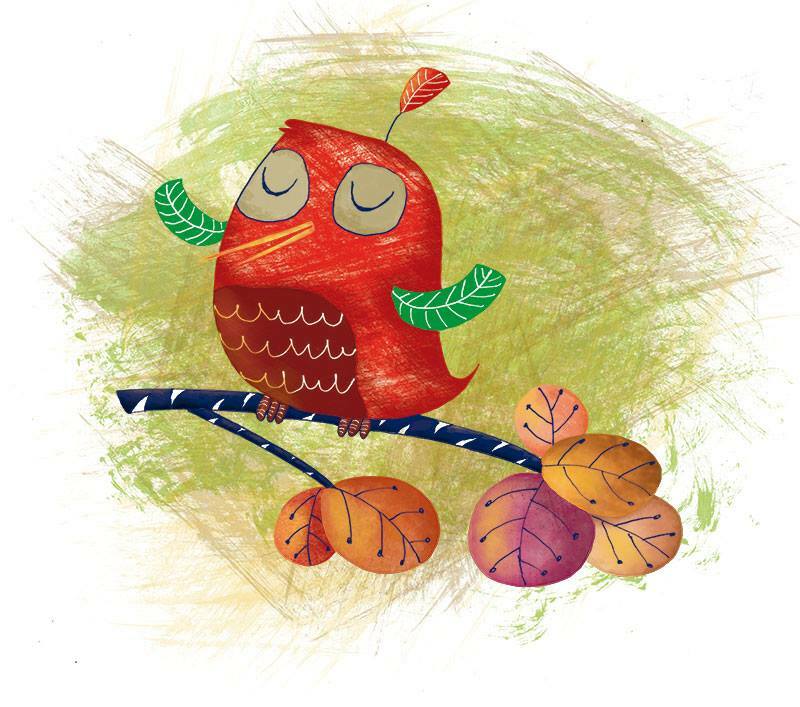 I am working on a children´s book project and on the creation of new illustrations for my portfolio. Something I love to do is to work with textures. You can create your own by using different materials at home. For example, you can look around for all those surfaces and textures with the potential to become a great accent to your work, take photos of them and apply them digitally. Also, you can use your watercolors or micro pen to draw your own patterns and use them in the same way. The possibilities are infinite! Persistence is the key. Don’t give up. First, work hard to find your style, it has to be unique, it has to be YOU. Things don’t happen at once. Then, read, investigate, and study the market; look for what’s best for you, topics and things that fit who you are and what you’re trying to communicate. If you have a minute, please leave a comment for Andy. I am sure she’d love it and I enjoy reading them, too. Thanks! Very cute and colorful art! Thank you for sharing.